The HP ENVY All-in-One combines sleek, modern design with cutting-edge power for a machine you won't just want to work on -you'll want to show off. 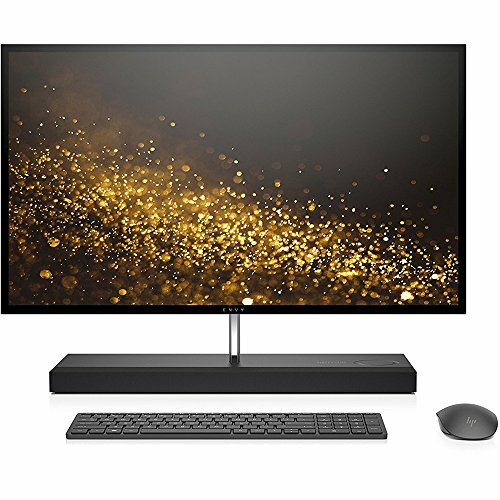 Why buy: A sleek and modern All-in-One with cutting-edge power that allows you to stream, play, and work efficiently. Processor: 7th generation Intel(R) Core(TM) i7-7700T Processor, Quad-Core, 2.90GHz; Fast, responsive performance and more natural, intuitive interactions with your PC. Video graphics: NVIDIA GeForce GTX 950M (4 GB GDDR5 dedicated); Play the latest games with fast, ultra-smooth performance. Display: 27-inch diagonal widescreen QHD (2560x1440) IPS WLED-backlit Micro Edge touchscreen; 3.7 million pixels for ultra-sharp details and definition, Technicolor Color Certified. Memory: 16 GB DDR4-2133 SDRAM; Designed to run more efficiently and more reliably at faster speeds. Hard drive and solid-state drive: 1 TB 7200RPM SATA and 128 GB PCIe NVMe M.2; Store files directly on your PC to access them quickly. Keyboard and mouse: Comes with the HP Premium Lifestyle Wireless Keyboard with volume control and optical mouse.